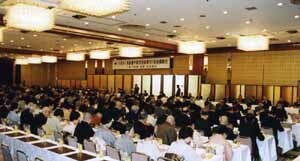 On February 25, 2003, the spring National General Meeting of Urasenke's incorporated membership organization, the Chado Urasenke Tankokai, took place at the Rihga Royal Hotel, Kyoto. The attendees mainly consisted of the presidents and executive managers of the organization's 165 chapters and 2 sub-chapters in Japan. Altogether, approximately four hundred representatives were present. Preceding the general meeting, the board of directors and councilors held a meeting, at which the new councilors (32), assistant councilors (29), and special councilors (31), whose three-year term began on the first day of 2003, were issued their certificates of entrustment. At the general meeting, the organization's officers and members of the board of directors were decided. 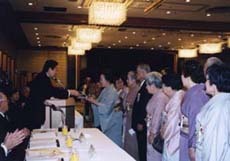 Also, there was the presentation ceremony for the Chado Culture Awards given by the Urasenke Foundation, and for the various awards given by the Tankokai to its domestic chapters that excelled during the previous year, and to individuals who have devoted long years of service as teachers in the organization's Gakko Chado program. awards for long years services. In conjunction with the chapter awards, a Special Award was presented respectively to two overseas Chado Urasenke Tankokai associations. They were the Chado Urasenke Tankokai Hawaii Association and the Chado Urasenke Tankokai Los Angeles Association. The former has the distinction of being the first official Urasenke chapter to have been established outside Japan. 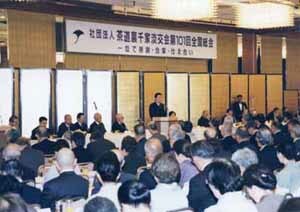 On the occasion of its 50th Anniversary celebration in 2001, it helped to sponsor Urasenke's first-ever international convention. Present to accept the award were the association's honorary president, Fujio MATSUDA (recipient of the Chado Culture Award at this meeting), together with his wife, Emi MATSUDA, and the association's executive manager, Albert MIYASATO. The Chado Urasenke Tankokai Los Angeles Association was founded soon after the founding of the Hawaii Association. 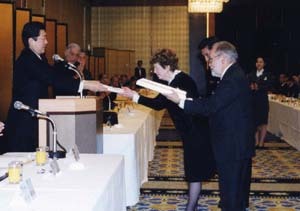 On the occasion of its 50th Anniversary celebration in 2002, it organized the Urasenke Tankokai North America Convention in Los Angeles. Flying in from L.A. to accept the award were the association's honorary president, Glenn WEBB, together with his wife, Carol WEBB, and the association's executive manager at the time of the 50th Anniversary events, Robert HORI. After the general meeting, there was a dinner gathering in the adjoining banquet hall. Urasenke Tankokai Los Angeles Association representatives Glenn Webb, Carol Webb, and Robert Hori accept special award.